‘It Will Come To Me ‘ is a title that came in to being during a late night conversation via Facebook chat messenger with Samela Otoviç. The main thrust of the conversation was concerned with what the title of the aforementioned exhibition should be. The title was eventually arrived at in a somewhat tongue in cheek manner but over the course of the next few days, as we talked about the nature of the exhibition, it became apparent that the title had different ways in which it could be read. Samela Otoviç is a student of Fine Art at Leeds Metropolitan University currently about to enter her second year. After a number of discussions surrounding the nature of what she is trying to achieve it was decided that we would do one last exhibition before the summer hiatus here at BasementArtsProject. The title could be read as a moment of hubris relating to the outcome of a degree that is still two years down the line. A shrug, a roll of the eyes ‘It Will Come To Me’! Samela has spent a lot of time and energy so far on her painting and considers herself quite definitely a painter. With her current line of enquiry she is considering a subject that occupies the thoughts of many artists; that of light and colour and how we perceive them. Colour, as Newton observed, is not inherent in objects. The colours we perceive are specific wavelengths reflected back towards our eyes from the surface of objects. When we perceive white what we are seeing is an object absorbing all wavelengths. This exhibition represents an opportunity for exploration, an exploration of the architectural environment of BasementArtsProject through Samela’s on going investigations into colour in painting. Now the phrase ‘It Will Come To Me’ becomes no longer a hubristic statement but an affirmation that her persistence will pay off and some kind of answers will indeed come to her. “If you take a ready-made object like an overhead projector and put it on a plinth or on the ground, does it become a sculpture? Or is it still an object? What about when it is switched on and you get a projection? Or if you add a microphone to amplify the sound of its fan? Is it an installation or is it still just an object? These are the questions that I have been asking myself for a year, trying to figure out how to create a space that could be an object, sculpture, installation and painting through the use of light. At what point did I start to see it as painting? Is it a painting if no actual paint is applied? The definition of painting is the application of a pigment or substance over or onto another surface. So if you are projecting colour through rays of light onto a wall and the only way to see it is through a window, is what you are seeing through the frame a painting? Or is the projection of colour the painting? And when you put your head through the window and see two projectors on the floor lying on their back projecting up onto the wall, are they now sculptures? 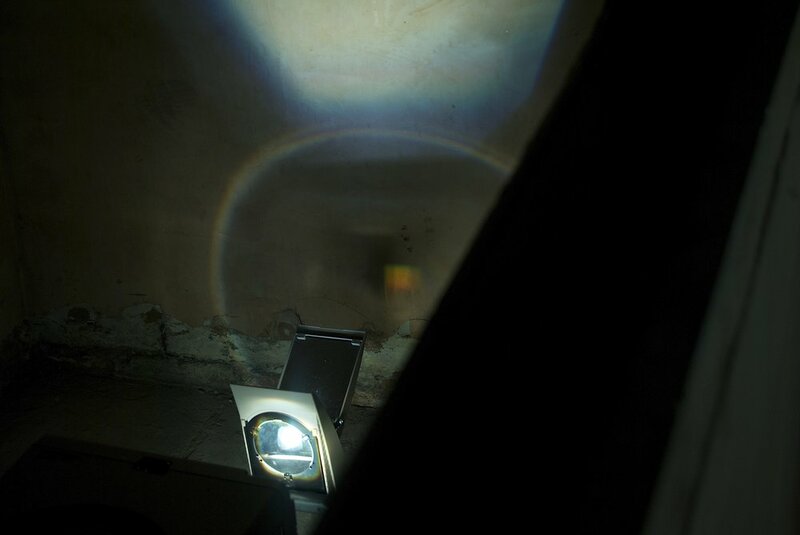 Does breaking the fourth wall by peering into this room filled with light and listening to the amplified hum of the projector’s fan mean that you are in an installation? Turning around, you find a number of projectors on plinths. Does the presence of plinths suggest sculpture? Considering the light once again, this time projected onto the plinths. Does it then become painting once more? What about the shadows created on the floor by the plinths now exploring the space making the whole of the area the work? Then the light lands on you. You are now a part of my work. ‘It Will Come To Me’ is a work made by a painter both intrigued and frustrated by the boundaries inherent to the medium.